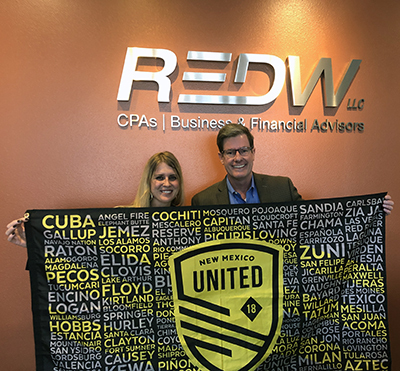 REDW LLC, one of the Southwest’s 10 largest public accounting and business consulting firms, is pleased to announce that it has become an exclusive business partner of New Mexico United (NMU), the recently launched professional soccer team in New Mexico. NMU began its inaugural season in 2019 in the Western Conference of the United Soccer League (USL) Championship. 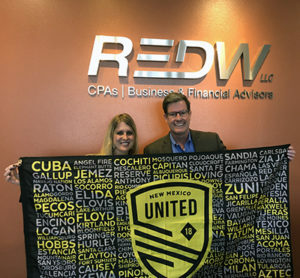 REDW is currently providing tax and accounting services to the franchise. Longer-term, the firm will play the role of trusted business advisor as NMU begins to establish its brand as a market leader and expand operations, including the potential construction of a new stadium. NMU formally announced its franchise on June 6, 2018. The decision to name the club “United” was made to reflect the spirit of its fans, and management’s desire to reflect and encompass the communities and people of the entire state. The team plays in the USL Championship, the second division of American soccer. For more information, please contact Gabriel Tevrizian, REDW’s Director of Marketing, at 602.730.3608 or gtevrizian@redw.com.